Hot pepper fanatics will often go to great lengths to fuel their obsession. As they eat their way up the Scoville scale they climb into ever-higher heat territory with each new pepper variety offering more of a kick than the last. There is only one way such a devotion to all things hot can end up: at the top of the scale. The Grow Your Own World’s Hottest Pepper kit offers an easy way for the capsaicin-addicted to achieve new heights for their endorphin rush. 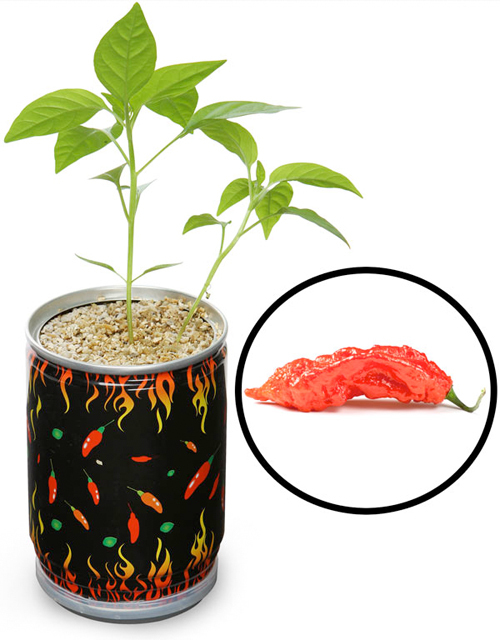 Just pop open the kit, add water and sunlight and soon your very own Naga jolokia (aka: Bhut jolokia or ghost chili) will be sprouting up, offering its temptation to all those brave enough to try. And of course, if the obsession ever gets out of hand, you can always nip it in the bud.